The first weekend of 2015 is already behind us and included some possibly record breaking cookie consumption and a quick visit to Massachusetts, which ended with me driving home in a crazy snowstorm. The storm made the trip an hour longer and gave me more than a few scary moments on the highway. By the time I got home, it had all turned to rain, and the only evidence of their even having been a couple inches of snow was on my Instagram feed. I love a good pair of skinny jeans and these look great on you, love the look! We're supposed to get a dusting of snow tomorrow. Happy New Year! I swear I need you to style my vests. I have such a hard time with styling vests and when I see your outfits you make it look super easy. Loving that red handbag by the way. Happy New Year! And oyyy, driving in that snow must have been crazy! I don't miss driving in snow at all. I'm glad you made it through okay. I really like your vest and this pattern mixing! Happy New Year! I love the herringbone vest! I never really understood the appeal of the puffy vest until I got one recently. Now I want one in a bunch of different colors. Hopefully it will still be cold enough in CA when I go back to wear one! I AM SO EXCITED TO BE COMMENTING ON YOUR OUTFITS AGAIN!!!!!!!! I love, love, love this! I have a puffer vest, the problem is that it is toooo puffy so while I am warm, I'm like a red marshmallow. Anyway, you once again have proven top chicness with this! Oh crap, that's a scary drive - glad you made it home safe. Great look, I am all for that shirt. Although I am used driving on snow and my car is well equiped for winter (a must here in the Alps! ), I try to avoid it as much as possible. We had a huge amount of snow over Christmas but a lot has melted already and I think even more will go soon. I am wearing a vest right now, they are so cosy aren't they? I LOOOOOOATHE driving in the snow so I feel for you! Glad it was gone for the ride back! Love that vest! Glad you made it home safe. Driving in a snowstorm is not fun. Love this look! I'm big fan of herringbone so you know that I'm dying over that vest. Happy new year! Oh, the joys of January weather. It's been raining so hard here that going outside isn't remotely worthwhile. I spent about 95% of the weekend in my apartment watching NetFlix and eating junkfood. Oops. Good thing healthy eating wasn't part of my new year's resolutions ;) On a fashion-related note, I love the subtle print mixing in this casual look. You make it look so easy! Oh gosh- those sound like really bad driving conditions. Glad you made it back safe and sound! I love the plaid shirt that you're wearing here. 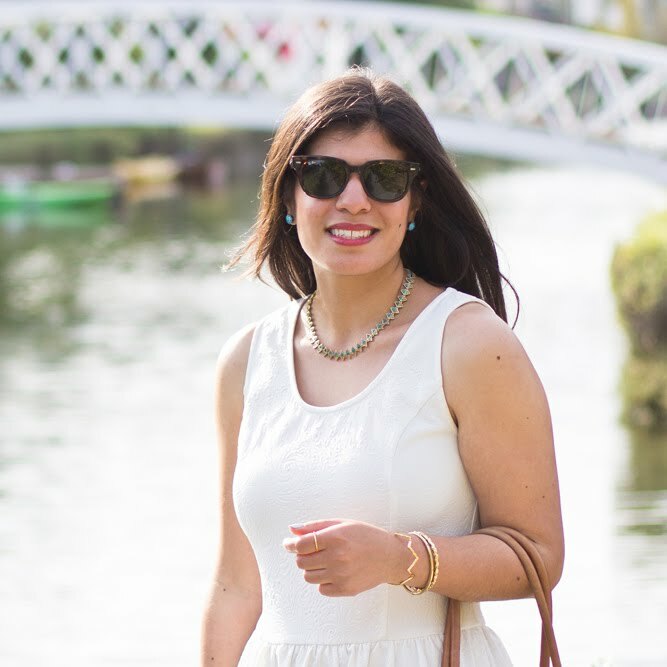 Gorgeous way to style the herringbone! 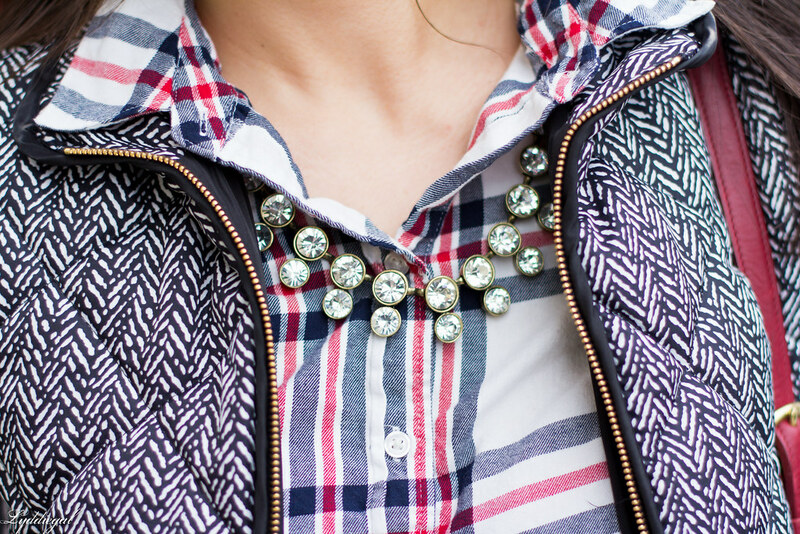 Love the plaid shirt with the necklace. I'm loving these layers!! 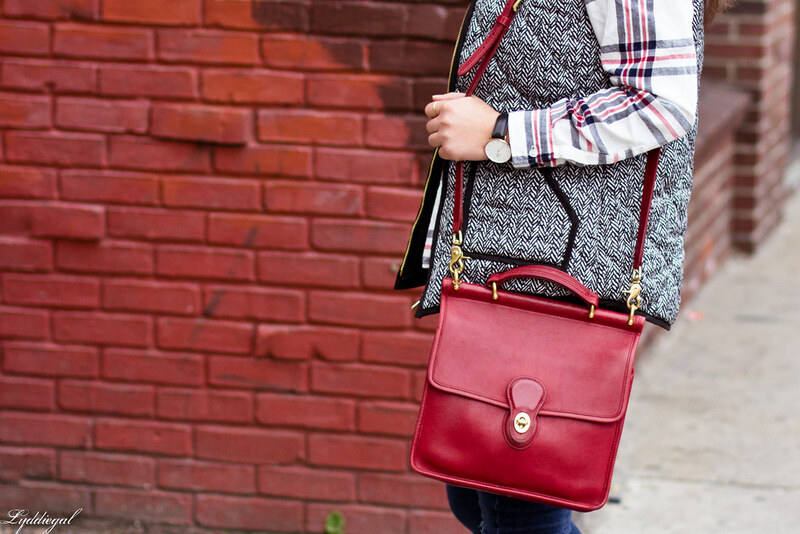 The plaid and herringbone are perfect together! I'm not really a vest girl but this one is kind of amazing. And it's perfectly styled too! So glad you made it back safely! That plaid shirt is adorable! Love how it looks with your vest! 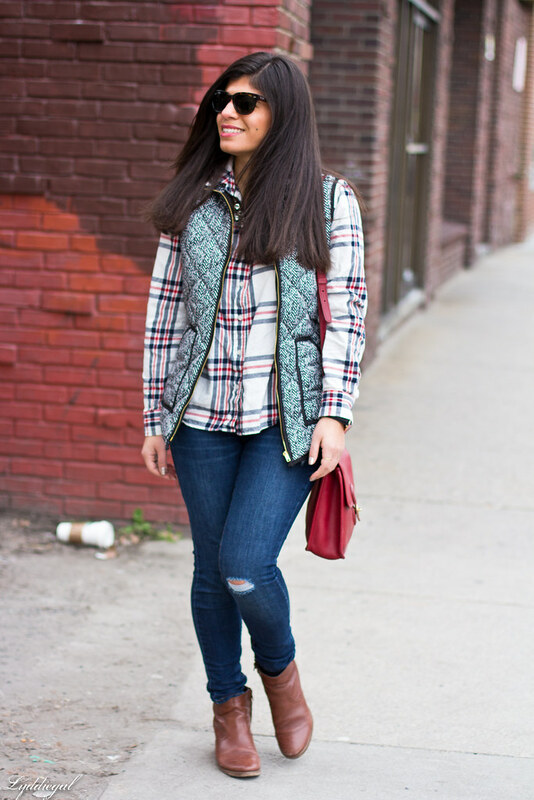 The vest is perfect with that plaid top! And your drive sounds scary, I despise driving in the snow! Love that bag in red, I must hunt it down on eBay. Great plaid shirt, I love it paired with the bag! So adorable! 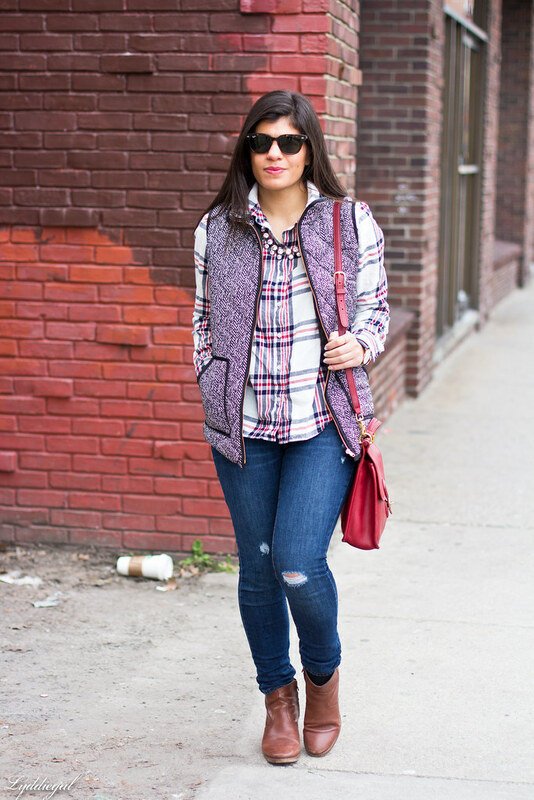 Love the tweed vest + plaid shirt! Perfect winter outfit! I have never driven in the snow before, the thought of it scares me!! 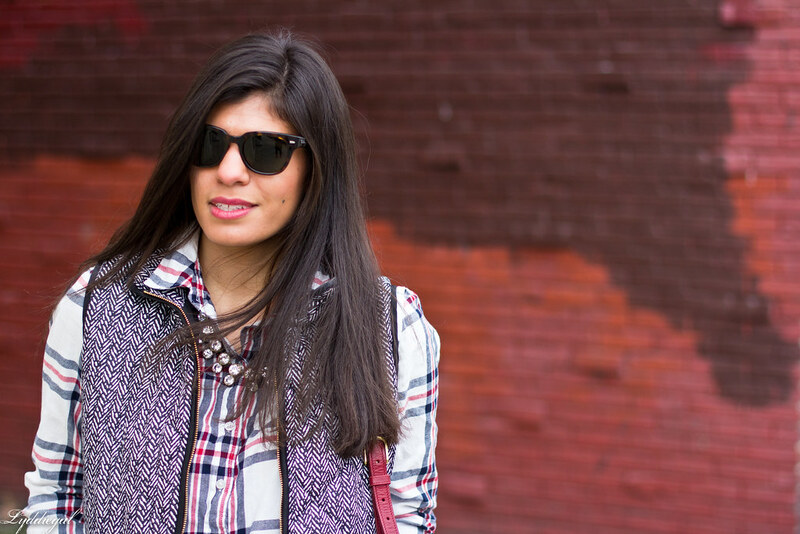 I adore this plaid shirt + vest combination!! I, too, just may have indulged in too many cookies over the holidays this year haha. Record breaking cookie consumption, ha. I love it. You look so chic and stylish here. I love the relaxed vibe. What a cozy and perfect winter outfit. Happy New Year, darling. 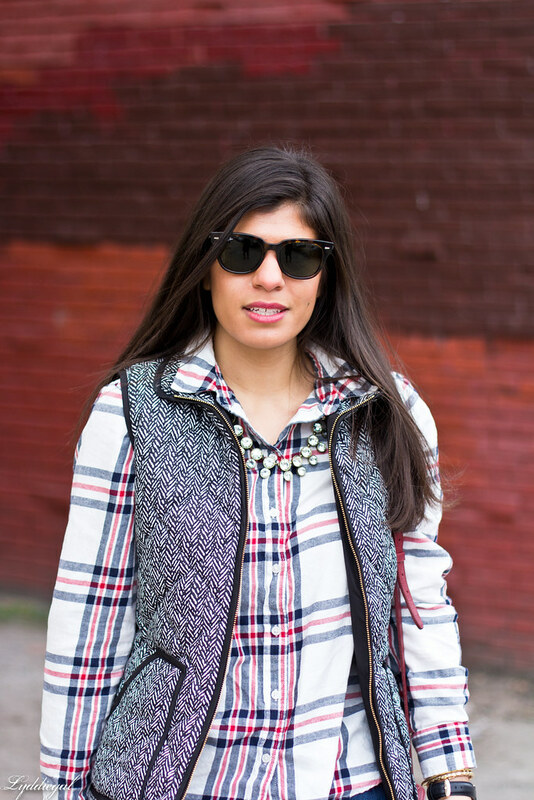 Plaid and the puffer vest are a lovely combination! I'm glad you made it back safely - snow and rain are never fun to drive through! great pattern mixing, I love this comfy casual outfit!